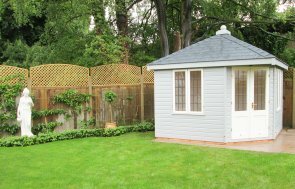 This charming Wiveton Summerhouse was recently installed for a customer based in Keyworth, Nottinghamshire. 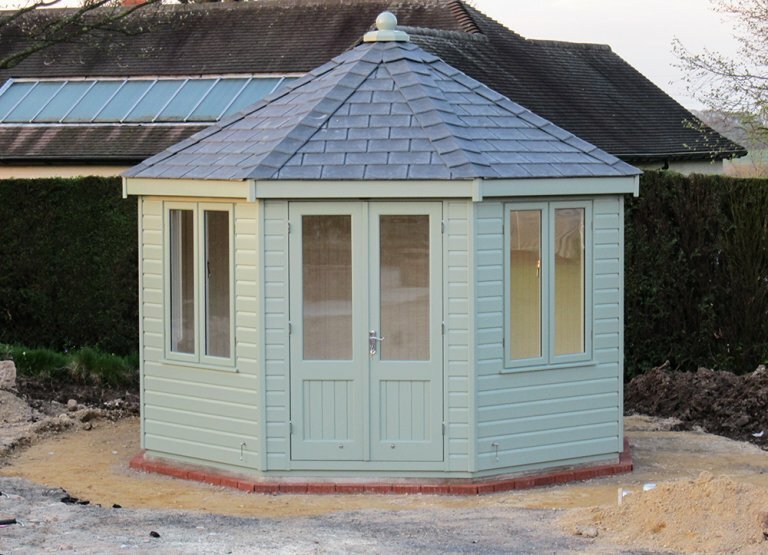 Measuring 3.6 x 3.6m, the distinctive octagonal roof is covered with grey slate composite tiles and a decorative finial which perfectly compliments the traditional aesthetic of the building. 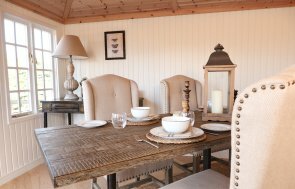 Internally, the building comes as standard with insulation in both the walls and ceiling and natural pine lining with a lacquered floor. The customer here has chosen to add insulation in the floor and opted for the painted lining option which will create a light and airy atmosphere. There is also a choice to have either polished brass or chrome door furniture which allows our customers to further personalise the final result. We have recently taken delivery and fitment of a 3.0 x 3.0m Wiveton Summerhouse and are completely delighted! Both the crews who laid the base and constructed the building were friendly, polite and helpful. They were well-organised and left the site clean and tidy. The summerhouse looks beautiful. Thank you to you all for a first class service! We shall certainly recommend your company to all our family and friends, those that have already seen it are green with envy anyway! Externally, the smooth shiplap cladding has been coated with our layered paint in the shade of Lizard which will not only protect against fungus and woodworm but keep its colour and quality for years to come. 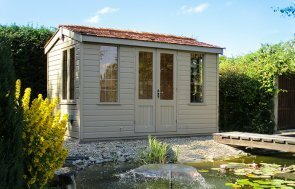 If you would like to browse our entire collection of Summerhouses you can do so online by visiting our extensive webpage or by alternatively contacting one of our friendly experts.